I’ve been providing commercial photography services for the Century Hospitality Group for the past few months to provide imagery for their point of purchase and website campaign for Delux Burger. This campaign features a different celebrity’s burger on the menu each month. Past celebrities have included Breakfast Television host Ryan Jespersen, Edmonton Journal food columnist Liane Faulder, Pepper & Dylan from the Bounce radio station, Mary Bailey of City Palate , and Warren Smith from Wild Game Consultants. Adam Ungarian from Hesco is April’s celebrity chef but I initially posted that he would the chef for March. 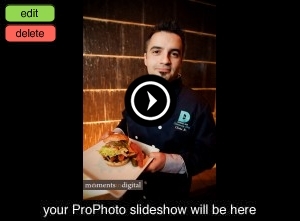 For the month of March, the Delux Burger Celebrity Chef is Chris Kourouniotis from CK Design Associates. Chris and his team provided the interior design for several of the Century Hospitality Group’s restaurants including Hundred and the newly renovated Century Room. Be sure to check out their new YouTube channel for a peek this newly redesigned hot spot on Edmonton’s southside. Chris’s burger features a 6oz lean Alberta strip loin steak burger, kopanisti, crispy prosciutto, shredded iceberg lettuce, Mediterranean salsa, on a fresh baked sesame seed bun. Be sure to stop by Delux during the month of March to enjoy this delicious burger that was really ‘well designed’ from the bun up. Looks like he’s got a nice amount of bacon on that bad boy.